​July 20 - Bay Area Air Quality Management District Board Meeting - Calling All Bay Area Residents! Bay Area Air Quality Management District Board Meeting July 20! Please attend the next hearing of the Air District Board. See info from Sierra Club​ below. For more insight into the importance of this issue please read this excellent article ​in the Pacific Sun by Will Parrish. Information from Sierra Club below. Also supported by our allies 350 Bay Area, 350Marin, Sunflower Alliance, and more. 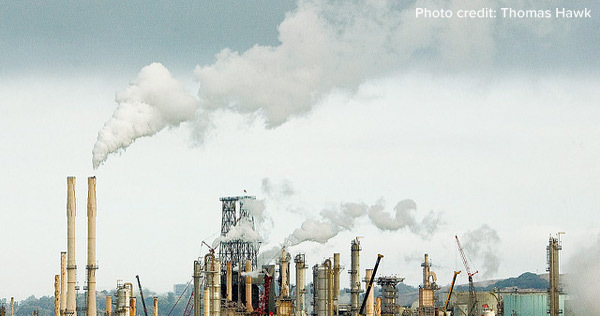 Join us next Wednesday to urge Bay Area air regulators to put caps on toxic and climate-destabilizing refinery emissions. Thank you for urging Bay Area air safety regulators to protect the air we breathe from toxic pollution. It's critical that we keep up the pressure on these decision-makers to clean up our air -- this year. That's why we'll be at the Air District board's public meeting next Wednesday to demand solutions that rein in the out-of-control refinery pollution that is putting our health and our climate at risk. Will you join us? RSVP to join us on Wednesday, July 20 to stand up for clean air for the Bay Area! RSVP: Click here to let us know you can make it! Fossil fuel infrastructure projects hurt families living in neighborhoods along rail lines and near refineries, where low-income communities of color already face a disproportionate pollution impact. Our climate is also at risk from exceptionally dirty sources of oil like tar sands. That's why we need a new rule that caps refinery emissions -- including greenhouse gases -- that would effectively keep out toxic tar sands and Bakken shale oil. It would protect Bay Area families from pollutants that cause asthma, cancer, and heart disease, and protect our climate from the dirtiest types of crude oil. Join us on Wednesday to keep up the pressure to ensure that we get strong, enforceable refinery regulations to protect our communities! Now is the time to mobilize and hold the Air District to its mission to create a healthy breathing environment for every Bay Area resident. Bay Area Air Quality Management District, Understanding Particulate Matter: Protecting Public Health in the San Francisco Bay Area, August 2012.